The campery could only begun when the 26 contenders were ready to take to the stage. Would I be ready for the competition that I unfortunately missed last year? Moldova was fierce! She brought the party, along with her dress rising to end the perfect performance. Finland, she was a girl after my own heart! 'Krista Siegfrids' sang her song 'Marry Me' and kissed one of her female dancers at the end of the performance, looks like someones used 'Eurovision' to push Finland's efforts to make Gay Marriage legal! I loved it! Belarus brought a slice of eastern spice to the contest with their song 'Solayoh!' Bringing some cuteness to the contest had to be Malta, 'Gianluca Bezzina' oozed the right amount of innocence without being too cute! I had missed Eurovision in 2012 due to living in New Jersey, USA, those Americans don't understand our European tradition of song! Yes, I'm ready Sweden! Things got downright bizarre with 'Cezar' who represented Romania, if I'm not mistaken he shared some similarities with reality star 'Rylan Clark!?' Romania used the 'Eurovision' gimmick perfectly by styling 'Cezar' as a joke 'Dracula' character. Ukraine brought a sensual extravaganza, which had elements of the film 'Avatar'. Whilst, one country that didn't impress me much with their vocal had to be Lithuania, either sing in your own language or not at all! One country that didn't make the final was Slovenia, I won't lie I was looking forward to 'Hannah Mancini's' work! Slovenia didn't get to sing their single 'Straight Into Love' but I loved it still. 'Margeret Berger' of Norway brought the arena down with her rendition of 'Feed You My Love' she sang in English perfectly and didn't look too shabby in her flowing white dress, she was a very sophisticated rock chick! Are you ready for more Eurovision? Would a fellow Scandinavian country take the title? I hate tactical voting of Eurovision! No M! Bonnie Tyler represented the United Kingdom with her hit 'Believe In Me'. The United Kingdom don't generally fare well in the 'Eurovision' but I had pride in Bonnie and my country on Saturday night! The political tones of this contest means that we, the United Kingdom don't get the best of the voting. I suppose bringing a unknown each year really doesn't make any different, well this year was an exception for the United Kingdom. Never-the-less, I know that we 'Held Out For a Hero' because this diva belted our song for all of Europe to hear. I think we as a country should think about pulling out of the 'Eurovision' for a few years, surely the financial strain on the BBC can't be too good when we always get low scores. Get it together United Kingdom! It was mad to think that we got more points than the Germans! No disrespect but Cascada's performance was fantastic! Bonnie Tyler! You did your country proud! I was sceptical about the slow tempo feel of the song when I first heard it but as she worked that stage in Malmö, I knew she had the perfect song! I guess 'Eurovision' will always have undertones of politics hidden within the songs and the voting, but it is a fun and exciting competition. Bonnie! We believed in you! My first Eurovision was in 2003, I remember the host city being Riga in Latvia and that I was routing for Sertab Erener who represented Turkey! She won out right with 'Every Way That I Can' I was hooked from there on in! The politics came into full force in 2012, lets just say the shine was wearing thin on this contest! Ireland's sweetheart was 'Ryan Dolan', my personal favourite of the whole competition. 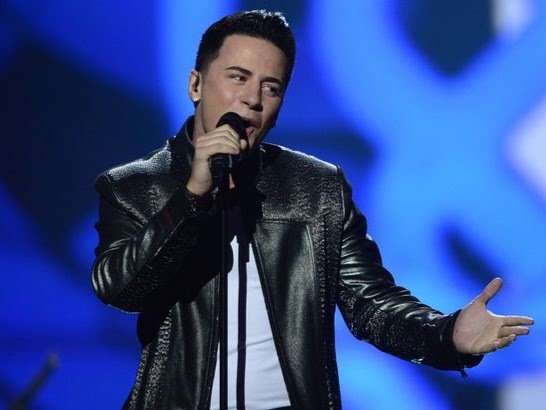 His song 'Only Love Survives' raised the roof at the Malmö Arena last Saturday, so why was Ireland's score so bad? This year definitely wasn't a singing competition because 'Ryan' deserved more points! Our 'love for you will survive' because his three minutes on the stage were filled with charm, camp and courage. Ireland's dance 'Eurovision' tune didn't just benefit from 'Ryan's' good looks and fantastic vocal ability there was also the addition of his hot male dancers, who weren't wearing very much clothing! I'm not going to complain! Ireland had a credible formula this year with a relatively unknown artist compared to the abilities of Jedward. Those twins might be making big bucks but they will never have 'Dolan's' talent! I reckon the future will be bright for 'Ryan' as his debut album 'Frequency' has just been released. I realised why I missed Eurovision so much whilst I was living in America, so thanks Ireland for bringing the Eurovision gold back! After the competition aired I went back over the semi-final performances to see the Eastern block member states still don't have a clue, as far as the Spanish I couldn't possible comment! Ireland had the man candy on stage for sure, I wanted 'Dolan' to take the crown but I suppose there's always next year?! It's sad that Turkey pulled out because of the actions of countries who have seen the light about Gay marriage, its not the dark ages so get your rebel on European because need to make a stand! I would still like to know why Israel is allowed to be a part of the European song competition I love!? I've never been one for Eurovision parties so I keep it simple by getting a bottle of my favourite non-alcoholic fizz to enjoy the annual Eurovision Song Contest! Maybe one day I'll make it to the real thing, shouting my chosen country in the crowd! Let's hope! As the voting period began the interval took full force, it was certainly a sterling effort made my Malmö indeed! Host Petra Mede broke into song as she was part of an all singing and all dancing Swedish show. Referencing about ABBA, Ikea and their love for meatballs this interlude was simple yet funny. A direct push for marriage equality was visible as two gorgeous men shared a kiss centre stage! Go Sweden! In true 'Eurovision' style last years winner 'Loreen' took to the stage to perform a medley of her new single 'We Got The Power' and her winning 'Eurovision' hit 'Euphoria'. 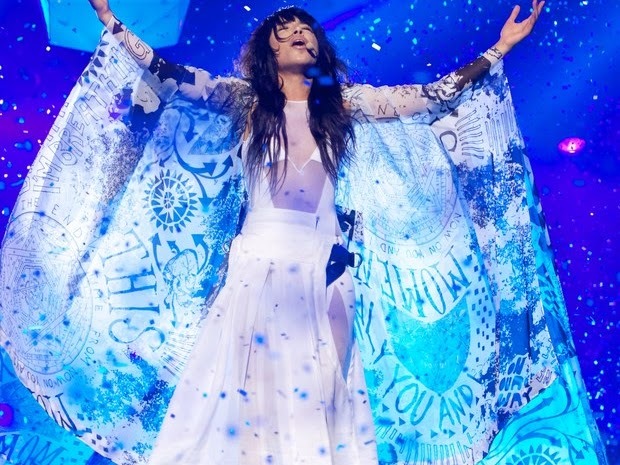 'Loreen' turned the party in her own special way, she's a testament that 'Eurovision' can showcase a credible pop artist. I have every confidence that 'Loreen' shall remain the star that she is within the music business. I bought 'Loreen's' debut album whilst I was in NJ so I always had something to cling onto! What on earth is a Smörgåsbord?! The votes were in and the winner had been decided, Denmark won the contest with a favourable 281 points. 'Emmelie de Forest' sang her song 'Only Teardrops' which put her and Denmark in first place. I wish Denmark well but know in my heart that a country closer to my home should have won! I would have been happy even if 'Cascada' took the trophy! Something tells me somewhere that if things don't change with the political voting certain countries will withdraw for good. I just hope that Turkey's absence from the Eurovision Song Contest isn't too long for I want another Sertab Erener to steal the points from the other states! I'm going to keep my favourites and not dwell on the poor scoring of the better acts, until next year Europe? The voting was downright wrong, its unfair when blocks of countries all vote for each other! I wanted to say 'Thank You for the Music' to Sweden for they had a true winner in 2012 and hosted a fantastic competition! Oh really Denmark?! No!